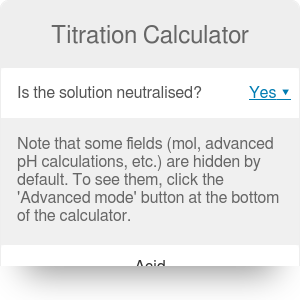 Our titration calculator will help you never to ask "how do I calculate titrations?" again. Acid base titration calculations help you identify properties (such as pH) of a solution during an experiment, or what an unknown solution is when doing fieldwork. By using a solution with a known molarity and a colour indicator, we measure how much of the solution is required to neutralise the unknown solution, indicated by a change in the indicator, which we can use to work out information about the unknown solution. Have a look at our neutralisation and molarity calculators as well! As you may know, when an acid or a base dissolves in water, their H⁺ and OH⁻ ions respectively dissociate, shifting the natural self-ionisation equilibrium of water (2H₂O ⇌ H₃O⁺ + OH⁻), making the solution more acidic or more basic. At pH 7, the concentration of H₃O⁺ ions to OH⁻ ions is a ratio of 1:1 (the equivalence point). Vb = volume of the base. Fill a burette with the solution of the titrant. Make sure not to pour the solution above your head, and to remove the funnel after you have finished pouring. Place the burette on a burette stand. Note the start point of the solution on the burette. You may need to remove some of the solution to reach where the measurements start. Measure out an amount of the analyte (it should be less than the amount in your burette) and add it to an Erlenmeyer flask. Add the indicator to the flask. Place on a white tile under the burette to better observe the colour. Start adding the titrant slowly, swirling the Erlenmeyer flask constantly. When the colour change becomes slow, start adding the titrant dropwise. Once the colour change is permanent, stop adding the solution. Note the endpoint on the burette. The difference between this and the starting point gives you the volume, and from this, you can calculate the molarity of the analyte using the equation above. Dispose of all chemicals safely. A titration curve is a plot of the concentration of the analyte at a given point in the experiment (usually pH in an acid base titration) vs. the volume of the titrant added. For an acid base titration, this curve tells us whether we are dealing with a weak or strong acid/base. When working with a strong acid and a strong base, the curve around the equivalence point will be relatively steep and smooth. This curve means that a small increase in the amount of titrant will cause a large change in pH, allowing a variety of indicators to be used (such as phenolphthalein or bromothymol blue). 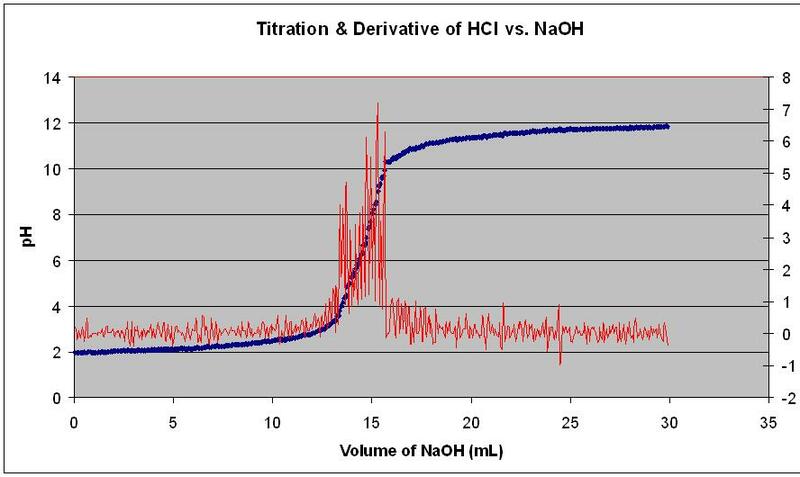 When dealing with a strong acid and a weak base, or vice versa, the titration curve becomes more irregular. Weak acids and bases are molecules that do not fully dissociate when in solution, that is they are not salts. An example of a weak acid is acetic acid (ethanoic acid), and an example of a weak base is ammonia. Because these molecules do not fully dissociate, the pH shifts less when near the equivalence point. The equivalence point will occur at a pH within the pH range of the stronger solution, i.e. for a strong acid and a weak base, the pH will be <7. For this reason, you must select the correct indicator for the right combination of solutions, as the range of colour changes needs to have the equivalence point in it. For example, when using a strong acid and a weak base, an indicator that changes at a low pH is needed, such as methyl orange (3.1-4.4). As titrations curves using a weak acid and a weak base are highly irregular, indicators cannot be used accurately. Instead, a pH meter is often used. The word titration comes from the French word tiltre, originally meaning the "proportion of gold or silver in coins," later meaning the "concentration of a substance in a given sample." It is then easy to see why French chemist Joesph Louis Gay-Lussac first used the term when performing early experiments into the atomic composition of materials (he would later go on to improve the burette and invent the pipette). It would not be until Mohr developed the modern burette in 1855 that the technique would become recognisable to us today, and has since become a popular method of performing analytical chemistry. To help determine what an unknown solution is, e.g. one collected from the field. Although exact determination is impossible, titration is a useful tool to find the molarity, and the titration curve can also be used to determine whether the solution is a strong or weak acid/base. If waste vegetable oil is being used to produce biodiesel, it is necessary to neutralise the batch before processing it. To do this, a small sample is titrated to find its acidity, which tells us how much base we need to neutralise the batch successfully. The addition of a base removes the free fatty acids present, which can then be used to produce soap. Titrations are commonly used to determine the concentration of acid rain that falls. These experiments are useful in monitoring the amount of pollution in the upper atmosphere. Titration Calculator can be embedded on your website to enrich the content you wrote and make it easier for your visitors to understand your message.